I'll be honest - I'm struggling with #frugalfebruary. I've had two occasions over the past week where I've sat with a shopping basket and forced myself to close the page and not complete the order. Torture - I blame the rubbish weather. But it's still in place with 12 days to go...we can do this! Valentine's Day was a nice distraction as Mr SGS bought me roses, chocolate and bubbles..
We then went on our traditional Valentine's lunch date...and in honour of #frugalfebruary, I wore the same outfit I wore last Valentine's Day! Though, I had to wrap up a bit more than last year, given the awful day..
and I ended up getting completely changed for the school run as we got soaked running to the pub...so it was Sorel boots and a waterproof coat (again) a few hours after these photos were taken! 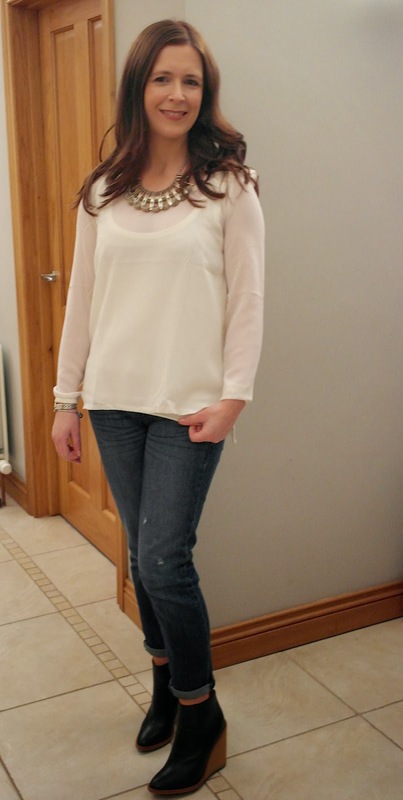 Oh and I had a night out also at my neighbour's house so I gave this cream top from Mango a turn. I got it back in January in the John Lewis sale. It's got a voile front (which needs a vest) and a sparkly mohair knitted back so it's quite nice for this time of year. Here's a close up of the back of the top. I can't find it online anymore in this colour way but it's available in grey on this link. I bought a size M which is about a 12. I wore it with my Gap Boyfriend jeans, Zara wedge boots, coat as above, M&S necklace - all old - and the Boden bargain cross body bag (the one I posted about on Facebook - if you're not following, you're missing out!). Reduced to £20 on the 31st January - the perfect pre-#frugalfebruary treat. Snapped up in a matter of hours and out of stock now. I hope some of you were lucky enough to get one...it's such a lovely bag. I can also now tell you about what I was up to on Saturday with the choir - we did a flashmob! We all sauntered into a Tourism Expo that was being held at the Titanic Exhibition Centre and started singing! The reaction was amazing. It ended with a couple of songs on the Titanic staircase - what an opportunity. I'll share some images when I can. Enjoy what's left of the weekend and if your kids are on half term break this coming week too - good luck! I love seeing you in a dress, you must wear them more often! I am doing ok so far .. I did cave, I have to be honest, BUT Boden just cancelled my order due to lack of stock (apparently they have done this to a lot of people with the clearance stock) so in reality I'm still ok and frugal February can continue! I take my hat off to you Avril.....your resolve during Frugal Feb has been amazing!! Like the Mango top - looks like a bargain too. I like your mango top - that looks very nice ! The blouse is feminine a d beautiful. LOVE the Zara wedge boots. I know what you mean about struggling with frugality- it's so difficult!!! And boredom certainly makes it worst. Avril you're doing so well with Frugal February....I'm with you in spirit but failed at the first hurdle I'm afraid...not surprise there lol!! I was really lucky, my 80% off Boden orders were placed by 10:50am, only 3 items and all shipped. Seems once the Boden email went out to everyone their stock monitor couldn't keep up (i've heard it refreshes every 15 mins) so ppl were essentially ordering the same stuff and there wans't enough to go round.